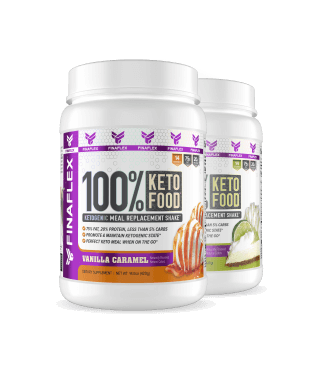 100% Keto Food can be enjoyed in a variety of ways due to the versatility of the powdered drink mix. If mixing with a spoon or in a shaker cup, mix vigorously for 30 seconds to ensure powder is fully dispersed. For a thicker, more flavorful shake, mix with 6 ounces of water. For a thinner, milder flavored shake mix with 10 ounces of water. If you prefer to blend your shakes it is advised to add the liquid first and then add in the scoop of powder to prevent powder sticking to the sides of the blender. is a high fat (75%), moderate-protein (20%), low carb (5%) diet that forces the body to burn fats rather than carbs for energy. The liver breaks fown fat into ketones (BHB) that are used as a primary energy source. No 100% Keto Food Reviews Found. 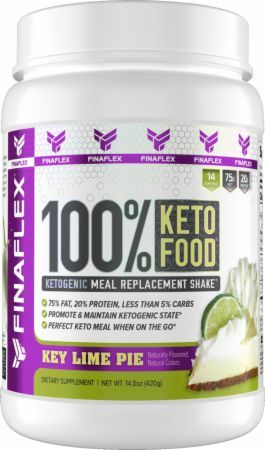 Directions For 100% Keto Food: Mix 1 Serving with 6-10 fl oz of water and consume immediately. Warnings: Use throughout the day as part of a balanced diet. Intended for use by healthy adults. Please do not use this product as your only source of daily nutrition. Do not use for weight reduction. KEEP OUT OF REACH OF CHILDREN. DO NOT USE IF PREGNANT OR NURSING.Consult your doctor or other medical authority prior to using this product if you have any medical condition, have a family history of medical conditions, or if you are currently taking any other medicines or dietary supplements. This product is intended for use by healthy adults over 18 years old. Stop using immediately if you experience any adverse symptoms or reactions. Discontinue 2 weeks prior to surgery. Product is sold by weight, not volume, and the contents may settle in transit; shake container before using. Store in a cool dry place. See bottom of bottle for Lot Number & Expiration Date. Foods with high levels of MCT may cause initial gastrointesti-nal (GI) discomfort, therefore it is advised to start with 1/2 serving to determine tolerance.